Personally a large shout out to our NWS regional offices JAN/BMX/HUN/MEM especially. The SPC also did a great job in getting the info out early and excellent wording/disco's on what was coming and ongoing. For our on air MET's if we are not blessed with the BEST, it is one of the BEST in the NATION period, IMO. Say what you well really do not care but personally James Spann and 33/40 team for the Birmingham market set/raised the bar greatly imo for this area. Yes I know some will disagree that is fine but he/team/live chaser feeds covered the MCS that morning and later on the terrible TOR outbreak I watched all 3 local stations at some point but hands down coverage believe he was on air/visible for 10+hrs and never blinked or left the picture. They had the sky cam on Cullman as the TOR was about to form and carried it throughout......had video of it with camera guy in the city as well. The Fayette/Walker county live feed as TOR roared through, Brian Peters crew. The Tuscaloosa storm John Oldshue had feed on it before it came into view of the Skycam network as it was developing and roaring towards the city once it was visible w/Skycam excellent video feed and then the Birmingham Skycam was all over it as it moved into W Jefferson county as well as LIVE video feed from the field yet again. The LIVE video on the web NEVER skipped a beat, no buffering and was stream-less over 30,000 viewing at once, again never failed once and the cell phone app again stellar. I'm from Hueytown/Concord but now live in TX. Heck, I'm 700 miles away and was calling my family in Htown to warn them! Just making the point that there is no reason ANYONE shouldn't have been unaware of the warnings and situation yesterday. Totally... big kudos to the NWS office handling the warnings and the local mets for getting the word to the public. The Long form on air coverage was fantastic. As I watched 33/40's live stream yesterday, I expected to lose him any second as the viewers went from 10,000 to over 30,000 in a matter of a half hour or so. No glitches at all. Also, the chasers in the field were excellent. I agree. James Spann did awesome, and is one of the best out there. I'm really pissed with Fox 5 out here in Atlanta. There was a conformed tornado on the ground up to 1 mile wide heading towards the Rome, Ga area. Classic hook and debris ball on the radar. They broke in for a minute to mention the tornado, then went back to American Idol...What the ###### is that crap. That really pisses me off, WSBTV did good, but like you said James Spann is one of the best. Honestly, after watching the coverage from James Spann, all the over tv coverage paled in comparison. I found Atlanta's to be poor overall the few times I checked in. Nowhere near the radar interrogation, even when debris balls were present. Spann has set the bar high and most come nowhere close to reaching it. Hi everyone - trying to read through but it appears everyone is safe so far. Last night was the scariest night of my life. When the storm hit early yesterday evening I lost power, internet, all cell service and had no idea what was going on. The radio wouldn't even come in clear enough to hear. I finally got cell service back late last night and logged on but couldn't post and then of course my phone went dead. My mother-in-law has power here on the far far south side of Bradley near Polk so I'm finally able to charge the cell and get on the internet. As of this morning, the latest totals are 6 tornados hit my county, Bradley Co., TN and there are 9 dead so far. The closest of the tornados hit 3 miles from my house. I will never forget that sound as I threw my daughter and the dogs in the basement closet. By the grace of God I have no damage at my house but I have been out of power since around 6 or so last night and according to the reports we are hearing we may not have power for a week as the path of the tornado near us seemed to follow the utility lines in our area. My husband was driving down from Loudon, TN and barely missed one of the possible tornados by pulling off the interstate. After arriving back in Cleveland it took him over an hour to get to our house (usually around 15 min) trying to get through trees and power lines. He made it home right before another tornado hit fairly close to us. Had he been any later getting back he may have gone right through it. Here in Cleveland curfews have been inacted, schools are out, destruction is everywhere. Roads are closed, sirens from emergency personnel are still blaring and helicopters are surveying. Last I heard is that areas of the city/county are still unable to be reached. My husband is going out to help after we clean up my mother-in-law's barn that was destroyed and I will be going with him. As bad as it is here, it's nothing compared to Alabama. My heart and thoughts and prayers go to all of you down there. My heart hurts seeing Tuscaloosa and Cullman and surrounding. What a nightmare I wish would end. Here is another look at the radar img I posted around 3:00 yesterday during the Cullman tornado. I couldn't tell where the tornado was in the Hamilton cell, but I know it had a few touchdowns later on. I couldn't trace any recorded tornadoes back to the cell NW of Tupelo, but the it looks ugly at that point. 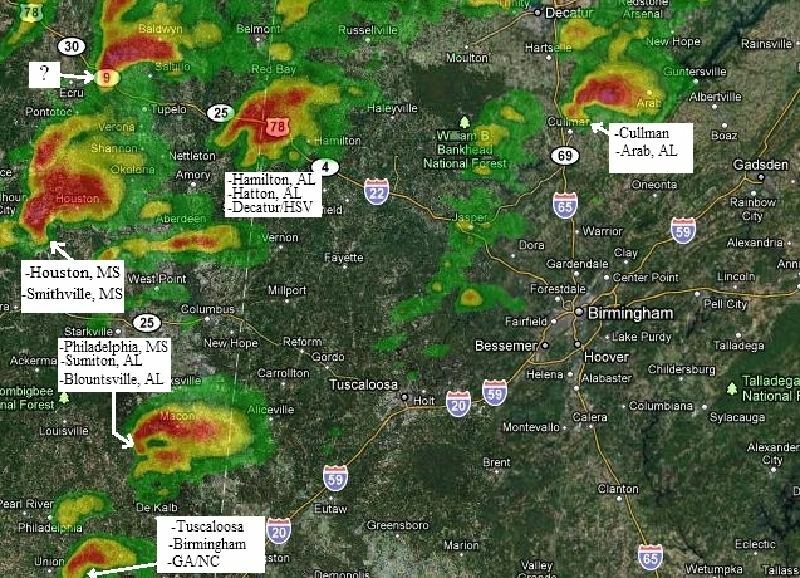 The Tuscaloosa/Birmingham tornado never had a big cell in front of it and stayed U-shaped most of the time I watched it. There was one more cell in the Shoals area at that point (cropped out) that could have had a tornado. Yes heard/seeing rants from many about Fox 5 showing "American Idol" over a life threatening situation that was CONFIRMED/ONGOING and IMO that is TOTALLY irresponsible of the station and managers running that station. Would be one to like and meet, ask personally what is your priorities here at this station? I mean seriously, reality TV of singing over reality of life with death and destructing occurring in real freakin time? Just another example/proof as just how blessed AL is with our on air mets/stations willing to go LIVE in prime time to try and save lives when warranted! Thanks for all the excellent posts with information NotoriousD!!! Appreciated greatly! About a mile north of my house, there is nothing. Homes demolished, every tree is down, debris everywhere. Then if you go about 5 miles north of my house, a whole community is basically gone. We were standing outside, because we thought we were in the clear based on where they seemed to say the tornado was going, but actually it went south of where they thought it did. We actually heard the roar, and were surprised we could hear it based on where we thought it was. Then I started getting reports of the damage just down the road. I have never seen anything like it and hope I never do again. The County I live in (Calhoun) has so many small communties that are just demolished. I haven't seen, but I've heard that Ohatchee is terrible, Peeks Hill is very damaged, Silver Lakes, Wellington, Websters Chapel, Pleasant Valley. I will be surprised if the death toll in Calhoun County doesn't rise way above what it is now. Please keep the rescue workers, and anyone that is helping with the search/rescue, in your prayers. I second what you said! How terribly irresponsible to not devote full coverage to this life threatening situation! They need to be called out on this big time!!! Death toll in Alabama storms increases to 162, officials say, raising storm total to 247 people dead in six states. Could the same storm have possibly dropped two F5's? Or possibly one that just didn't leave..
What's interesting is if you go to BBC.com, we're the big headline despite the royal wedding tomorrow. I think this may lead to even better coverage if possible with 33/40 I think we could assume they will reap the benefits and even look for more ways to improve.....with adding of new Skycam locations w/upgrades to the older systems currently in place and possibly LIVE use by the public at some point but will need a lot bandwidth to do but very possibly this will happen at some point. I know this is something that 33/40 is wanting to do as well. Then the drive of competition by other stations will more than likely go into a higher gear to try and "catch up"....so personally would not be shocked to see a "new wave" of improvements heading to the Birmingham market area. I am just stunned. I was already planning to come to Alabama for a funeral next week, before this occured. This is just heartbreaking. My supervisor compared this to a horrific cheesy disaster movie. During the time we were watching the Birmingham tornado, he was so horrified, I had to send Brittany to find the supervisor's girlfriend to help calm him down. It was just too much to watch. It was heading toward our old stomping grounds. Even though Brit and I moved over here for her "dream job". Do we have a Google Earth track of the path yet, because I'd be interested in the damage path. Some of the photos I'm seeing from Concord seem to confirm what most think/know. The ground is just completely churned like a mixer. Inflow on the video rivals Xenia/Greensburg. Some of the aerial footage is stunning and even more devastating than Oak Grove. Just unbelievable. We could very well have seen an F5 rolling from Tuscaloosa all the way to Pratt City. In fact, we might found out that the system produced a tornado of some rating across the entire state. Edited by bingcrosbyb, 28 April 2011 - 12:22 PM.